As of 2014, interior designer reported in the National Kitchen and Bath Association annual survey that quartz -- Silestone, Zodiaq and Caesarstone are all brands of quartz -- and granite are the top two countertop material choices. The primary distinction, of course, is that granite is a natural stone. Quartz, on the other hand, is a composite or man-made material that includes a combination of crushed quartz matter and resins. The ratio of quartz to resin varies by manufacturer, but minimally, it contains 90 percent crushed quartz. 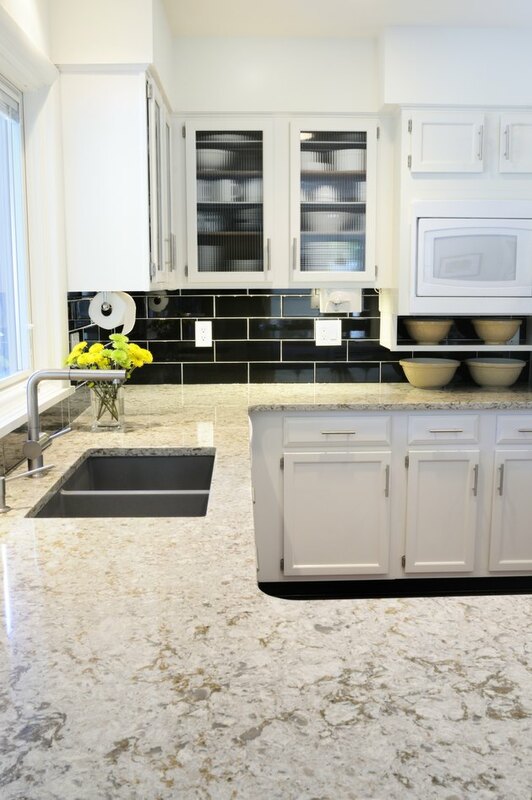 Granite and quartz counters are favorites with designers. A natural stone cut directly from the earth, each granite slab is unique; once a stone has been fully mined, it is no longer available. Rare colors and additional veining cost more. Since it's porous, granite requires maintenance. Polished and matte finishes, when properly sealed and cared for, are most resistant to heat, cuts and scratches. Placing hot pots directly onto granite, sealed or otherwise, is discouraged. Though strong, granite does not eliminate the need for a cutting board; it can still nick and scratch. Be wary of foods and beverages that may stain your counter if left directly on it, such as red wine, tomato or lemon. Silestone contains 94 percent natural quartz. Stronger than granite, Silestone has a Mohs hardness rating of 10 -- versus 7 for Caesarstone and Zodiaq. At the time of publication, the scratch-resistant material is available in 104 colors and three finishes: polished, suede and volcano. Naturally non-porous, Silestone counters do not require the same maintenance and sealing as do granite countertops. Unique in the countertop world, they come with a 25-year written warranty. Another exclusive feature is something called Bacteriostatic Protection, which is a silver ion technology that claims to stop the spread of bacteria. Available in 46 colors, DuPont Zodiaq surfaces are stain-resistant and do not support the growth of mold or mildew. They contain 93 percent quartz and 7 percent resins. Cleanup is simple with just soap and water; no other maintenance is required. As with granite, it is recommended that you do not place hot pots directly on the counter surface or use the counter as a cutting board. Many installers will gift customers with a finished cutting board made from scrap pieces of the same color material for a continuous look. Caesarstone offers 79 colors and three unique collections: Classico, Motivo and Concetto. Motivo is limited in color to light neutrals and blacks, but features textures like crocodile, a damask-like lace and stripes, which adds an interesting element to the design. Concetto is mixed with semi-precious stones such as agate and amethyst, offering a very high-end look. Some of the Concetto products can be lit from beneath so that it appears to glow. Composed of 93 percent natural quartz, all Caesarstone products are stain-, scratch- and heat-resistant.